y = amplitude * cos ( frecuency2 * time + phase ) The shape of the curves are highly sensitive to the ratio frequency1/frequency2. Do experiment with different values of the frequencies and the phase using the fields provided in the simulation. 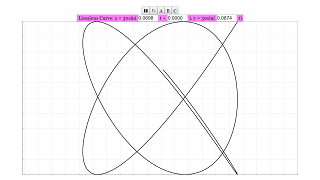 This virtual-lab will enable you to analyze the Lissajous figures. The view of the virtual-lab contains three buttons (A, B and C), which set predefined values to the frequency and the phase of the harmonic signals. In addition, the numerical values of the frequency and the phase can be selected by the lab's user. Lissajous curves are a family of parametric curves studied by the French physicist and mathematician Jules Antoine Lissajous (1822 - 1880). The shape of the curves is highly sensitive to the ratio frequency1/frequency2. There are 3 curves A, B, and C in this simulation, which is vastly different from each other. The amplitude of the curve is set to 30, but both frequencies and the phase can be changed. Do experiment with different values of the frequencies and the phase using the fields provided in the simulation, and see how the graph changes.